Comedian and presenter Russell Brand is to go head to head with Jonathan Ross after landing his own Channel 4 show. 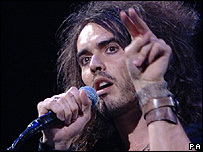 The Russell Brand Show will feature celebrity interviews, comedy sketches and live music performances. The new programme will debut on Friday 24 November at 2305GMT - BBC One's popular Friday Night With Jonathan Ross starts at 2235GMT. Channel 4's Factual entertainment editor Angela Jain said: "[Brand's] undoubtedly the man of the moment." Last week it was announced that Brand had landed a new show at BBC Radio 2 after a successful eight month stint at the digital BBC radio station 6 Music. The 31-year-old's radio show will go out in the weekly 2100-2300 slot, from 18 November. Brand found mainstream fame as the host of Big Brother's Big Mouth on E4 earlier this year, and was first introduced to Radio 2 listeners in March when he stood in for Mark Radcliffe.